Two days later, I took the leftover racks of lamb and cut them into double chops, fired up the stovetop grill, and seared them for just a couple of minutes on each side to cook them up a little bit more, and warm them all the way through. 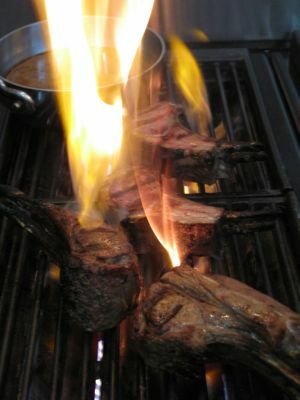 It’s amazing how flammable lamb fat can be and the flareups on the indoor grill were quite spectacular! Despite a heavy duty exhaust fan, the kitchen was soon filled with smoke! Mrs. Marketman had cooked down the remaining marinade with a little stock and some flour to make a simple gravy. The recycled chops were as delicious as the first time around. Still incredibly moist and flavorful and still cooked to a medium doneness despite the double grill… We served them with the gravy and a sprinkling of chopped Italian parsely. YUM. These are one of those often overlooked party dishes that are delicious, elegant and EASY to do. Oh, and Marketman’s tip for the dish? Cover the “frenched” bones with aluminum foil so that they don’t char too much on the barbecue grill. Take the foil off for the last minute or two of cooking if you like. That looks so yummy! I am drooling at the pics MM! I’m not really a fan of lamb but your last pix looks so delectable! Oh, that last photo! The carnivore in me is craving for it now, and it’s not lunch yet! MM, have you tried marinating any grillable pieces of meat in miso? I’ve read it makes for a good marinade; I know I’ve eaten something in the past that was marinated in miso, but haven’t had the opportunity to try it yet. That looks really yummy! We don’t eat lamb too often but when we do, we use a very simple marinade of salt, pepper, olive oil, fresh rosemary and crushed garlic cloves. We let it sit refrigerated overnight and grill it the following day. I don’t mean to gross anyone out. . .while on vacation in San Diego 2 years ago, we decided to have dinner at a Blue Ginger in the Gaslamp district. As the hostess was seating us, a cockroach crawled across one of the plates :( We all did an abrupt about-face. Angela, yuck, but it does happen in restaurants… I sat on the food committee of a posh club when they decided to seriously fumigate the kitchens, and for several days afterwards, all manner of flying cockroaches were escaping the kitchens and storage areas into the dining areas… Mila, no, I haven’t tried a miso marinade yet… hmmm, sounds interesting though. Grilled lamb is one of my favorite things! We like it simple, too –just freshly ground salt and pepper, good olive oil, a little balsamic, some rosemary. The gravy looks great! Someone might get mad, hehehe. high school classmates to come with me to the hotel where they serve the finger licking good chops…. ang sarap naman! the last pic is a killer and looks like a restaurant meal. lamb is also yummy done kebab style with cumin, chili flakes, black pepper, chili powder, garlic and salt. 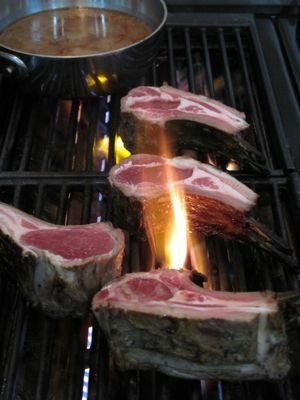 We went to a lovely restaurant recently and we ordered chargrilled hamonado lamb cutlets and it was divine! We’re going back for more this coming Father’s day! MM, now you have to teach us the secret of staying slim with all the good food that you eat. Do you just take pictures of the meal and just smell the dish? Nice lamb chops. MM, its my first time to write on your blog. It was my cousin in the US who gave me your website. I have been going through your archives and find your articles really very interesting. 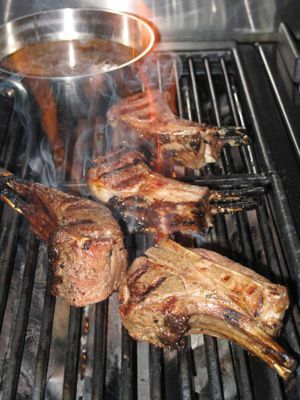 Lamb chops are not a regular fare on our dinner table but me, my wife and kids love them. I think i’ll buy and cook this coming weekend. LAMB CHOPS! !, LAMB CHOPS! !, LAMB CHOPS!!!! Hi MM, Good luck on your weight goals. Just stay off the rice and soda (I also have to stay off them). Eat like a king during breakfast, a queen during lunch and a pauper during dinner. Off topic muna MM and commenters, please test your ovens, specially if you have an oven with a Maytag brand please read on. MM, where do you buy your lamb chops? Supermarket lambchops are quite pricey yet quality is not that good. Our only alternative so far is Santi’s. Lamb Chops! Actually, lamb and mutton anything. 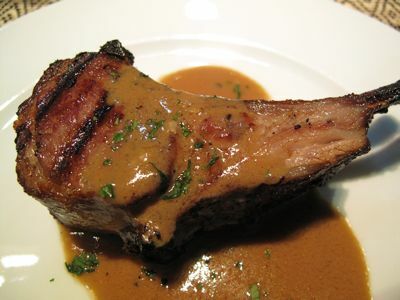 =) I love grilled lamb chops but for mutton, some Indian preparation like curry or rogan josh. mommy, I think Mrs. MM got the racks of lamb from Santis, and asked the butcher to “french” them (or clean the bones). They are a bit pricey, but pretty good quality. Julia Child’s lab marinade which has been our standard for years: 2 cloves garlic, 1/2 tsp salt, 2 Tbsp Dijon mustard, 1 Tbsp soy sauce, 1 1/2 tsp ground rosemary, thyme or oregano, 2 Tbsp lemon juice…mash garlic with the salt then mix in with the rest of the ingredients. Whisk in 1/4 Cup olive oil bit by bit like youre making mayonaise. Rub all over your lamb…it is fantastic. Marinate overnight if possible. Looks like Ming Tsai got his inpiration from one of my culinary idols! I ignore the 1 1/2 tsp of the dried herbs and use loads of fresh thyme and rosemnary. I also grate the lemon jest and add it into the marinade. Never fails to impress the dinner crowd. We tend to butterfly and grill the leg over indirect heat. Good stuff! I miss eating lamb chops… huhuhuhu… where did you get your lamb chops??? I knew Silence of the Lambs would come up :P any thoughts as to cooking a whole animal? I mean cooking from the head down to the tail? Head cheese, offals, trotters. Spare parts, that sort of stuff. How about calories of lamb? how high it is?